If a loved one of yours is retiring soon, show off your creativity by organizing a celebration that features a number of homemade decorations. Consider the guest of honor's line of work, personality and lifelong aspirations for inspiration when making customized decor for the event. Tie balloons to wooden craft sticks and place them in a vase for a homemade centerpiece that is colorful and attractive. Mini balloons that say "happy retirement" are appropriate. Balloons in the shape of the number of years your loved one has worked will make the bouquet stand out as well, along with stickers on the vase in the shape of these numbers or the guest of honor's initials. Create tasty table decor that represents the guest of honor's career and place the accents in the center of the table for guests to enjoy. For the retirement party of a teacher, prepare a platter of apples prepared several different ways, such as caramel apple slices, apple wedges rolled in cinnamon and sugar, and mini apple tarts. Table decor that represents your loved one's morning routine is ideal as well. For instance, present guests with mini cups of espresso on a silver or gold tray in the guest of honor's favorite flavor. Include small scrolls of newspaper pieces tied with ribbon as tray decor to represent your family member's ritual of reading the paper and enjoying coffee every morning before work. Use a plastic tablecloth; customize it by stapling or gluing magazine pictures of vacation destinations or cutouts of palm trees, depending on the guest of honor's vacation preferences. Add streamers all around the table in colors that match the magazine clippings; use bright orange and yellow for summer destinations or blue and white for a tablecloth with a winter vacation theme. 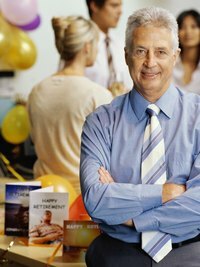 Place a personalized poster in the center of the table with your wishes for the new retiree. Have it signed by all the party guests and adorned with vacation-related stickers in the shape of lawn chairs, cocktails or sunglasses. Choose a tablecloth made of paper or plastic that the guest of honor can write on. Supply a marker at the table so your loved one can detail some of the activities on his bucket list. Include small bowls or vases in the center of the table that represent an activity your family member has always wanted to try, such as a bowl with mini chef hat cutouts and small pieces of brownies to represent her goal to learn how to become a master baker. Include the giant card you and your loved ones have signed on one end of the table to draw more attention to the decor.